It's been a while since I have posted about bee blocks and really anything else other than my Stitch Tease Quilt. 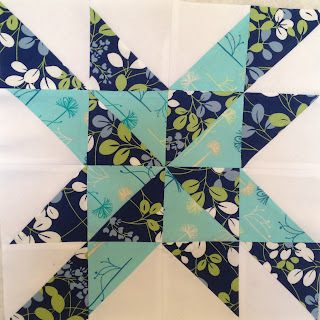 But, if you have not read about it or are interested in seeing all the beautiful submissions in the Blogger's Quilt Festival, click on over to Amy's blog to read about my quilt and the hundreds of other gorgeous creations. A few months ago I joined the 4 x 5 bee for the Spring round and it was an easy bee and really fun to make the same block in 6 color combinations for my hive mates. I asked for blocks in colors of the sea; blue, aqua and green. These are the blocks I received, along with the block I made for myself. I hope to join another round of this bee and ask for the same colors so I can get enough blocks for a quilt. I might need more than one more round but either way I am loving these colors. I really like those shades of blue too! I love the block. Gorgeous blocks - given and received. I still need to do something with the blocks I received but I went off the colour scheme so I'll have to ponder that one! The blue and green blocks are really pretty! It is such a fresh and cool colour combination! Your blocks are great, and the colors are just what you asked for. Great job! I am also going through a teal and blue phase.